It is my experience that the spirit world is always trying to communicate – it’s really just a question of whether we can understand the whispered messages. Beginning in November 2015, dragonfly power animal showed up in my life. Just as you can find yourself falling in love without even trying, I wasn’t actually looking for dragonfly medicine when it showed up seemingly unrequested. At the time I felt fully content with my mother snow leopard, baby snow leopard, hawk and hummingbird. I had already spent years meditating on the blessings of these power animals, communicating with them and using their gifts in my work as a medical intuitive healer. My main power animal is snow leopard, whose gift is to allow you to leap over major obstacles so quickly and easily you don’t even realize at the time what you just got past. I love my mother snow leopard, and within a year of working with her a baby snow leopard playfully pounced into my meditations and never left. Hawk, who views life from high in the sky, and hummingbird, the giver of endless joy, soon followed. It also wasn’t as if I was particularly looking for extra guidance in my life. I was towards the end of completing my fifth book, Unlimited Intuition Now, when a dragonfly symbol appeared in the form of an amazing necklace given to me by my dear friend Ramajon Cogan. The brass-colored dragonfly Rama gave me serendipitously just happened to match perfectly a pair of brass dangling earrings with hearts and stars and rhinestones I had bought for myself the week before (I’m one of the lucky 57-year-olds who can wear rhinestones as happily as a six-year-old). As soon as I received this amazing gift, I began wearing the dragonfly around my neck every day. Not only is it beautiful, it felt very protective of me at the time. Looking back, I now realize that as I was completing Unlimited Intuition Now and receiving dragonfly medicine I was also simultaneously receiving the insight that I needed to leave my fiancé. Within six weeks, I had broken off my engagement. Within eight weeks, my mother, completely, separately and independently, gave me a pair of dragonfly earrings with grey pearls on them for Christmas. A few months later, one of my dearest old friends also separately and independently without me asking for them gave me yet another pair of dragonfly earrings, these ones on the ends of silver dangles. And then Rama gave me even more – a second dragonfly necklace and a third pair of dragonfly earrings with abalone shell. It was as if the people who really loved me knew what I needed even if I didn’t. And then I discovered that I had accidentally chosen to write in a dragonfly journal. I began to realize that my next book – whatever it happens to be about – needs to have a dragonfly on the cover. So I began to pray to be able to take photographs of dragonflies, even though they are notoriously swift. One of my best friends mentioned that the pond on her family farm near Watkinsville, Georgia, is full of dragonflies, so I drove out one Saturday with high hopes to take a look with her. Before we went down to the pond, I was practicing yoga in the grass by myself when a white-spotted dragonfly kept dive bombing me. He did not stay still long enough for me to snap his picture however. As dusk settled, my friend and I drove down to the pond. My own iPhone had lost power so I managed to capture a few fuzzy pictures there with her iPhone, emailing the photographs to myself afterwards to take a closer look at what we had witnessed as the sun began to set. 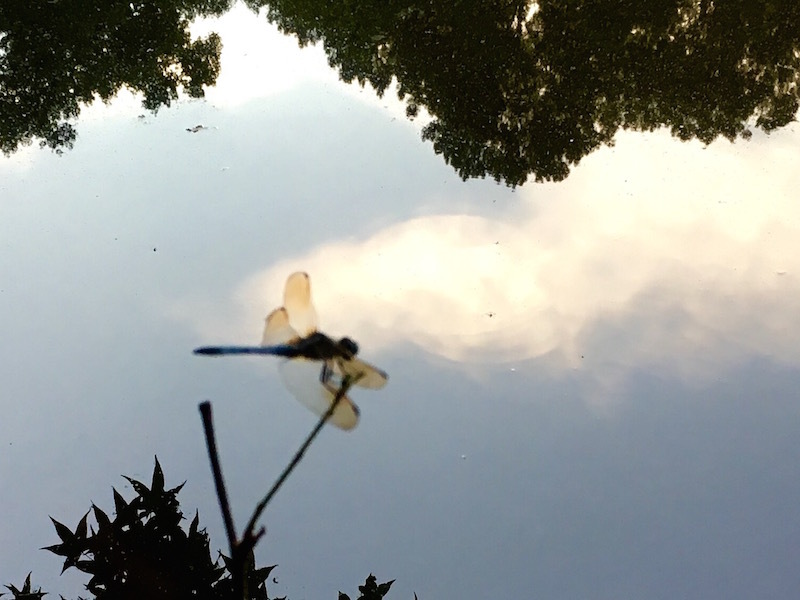 This past weekend the dragonflies followed me when I went to visit my family down in Savannah. One morning, I drove across the river to take a walk at Turnbridge, our family rice plantation in South Carolina now owned by my brother. Due to the relentless mosquitoes this time of year, you have to wear long sleeve shirts and long pants along with a hat to keep the sun off your face even though the temperature can easily reach 95 degrees. I kept as much in the shade as possible but still managed to sweat profusely. I went for the usual amazing bird watching, but everywhere I walked along the banks of the old rice fields I was followed by dragonflies. Had they been there before, all those years, and I not really noticed? I drove back to my mother’s house on Liberty Street in Savannah and decided to sit on the porch to read and relax. I lay back in a rocking chair and stared up past the hanging baskets of flowers. The largest dragonfly I had ever seen in my life suddenly appeared and kept landing on the roof of the porch! When I close my eyes to meditate, I keep asking to be able to talk once again to my mother snow leopard, my old friend, but dragonfly keeps interrupting. As I chase these tiny sparkly creatures through the latest chapter of my life, I concede I’m still lost in the mystery of what it is they are teaching me, what it is I’m supposed to write my next book about and why they just won’t let me alone. I must readjust the very core of my very being to dragonfly vibration – light, soft, swift and quiet. Perhaps if I learn to hear their whispers if I am patient perhaps in time I may discover!